We have all seen the commercials regarding dementia, hear of it from a friend or co-worker or may have even known a loved one who suffered from it. Given that it is international Alzheimer’s month, let’s talk about and get to know the disease that effects more than 7 hundred thousand Canadians today. Alzheimer’s in particular is a type dementia that is characterized by difficultly remembering new information, confusion about the day’s events, and changes in mood and behaviour. This disease normally affects individuals over the age of 65 and accounts for 60-80% of all dementia cases. It is a disease that progresses over time with worsening symptoms and sadly has no cure. However, there is still hope as some studies have suggested that physical activity can help slow the progression of these symptoms. (Alzheimer’s Association, 2018) (https://www.alz.org/alzheimers-dementia/what-is-alzheimers). There seems to be no end to the beneficial effects of exercise when combating all types of illnesses and diseases and Alzheimer’s is no exception to that. A 2016 study looked at the effect exercise has on functional performance and fall rates in individuals with mild and advanced Alzheimer’s disease. What they found was that those with mild Alzheimer’s disease had a significantly slower day to day decrease in their physical functioning in comparison to the control group (which did not change their exercise levels). Similarly, the addition of exercise was proven to help decrease the rate of falls for those with advanced Alzheimer’s disease (Öhman et al, 2016) (https://www.karger.com/Article/Abstract/445712). For older adults where stability is a concern, regular walking and exercises can pose various complications and fall concerns. Nordic Walking, which incorporates poles, helps to promote stability, balance, and confidence when walking. 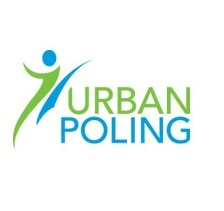 In addition, walking with poles is a great full body workout where you can adjust the intensity to your specific needs. In particular, for older adults, our ACTIVATORTM Poles, are able to bear more weight and have a bell shaped tip which provides more stability while encouraging an upright symmetrical posture. Knowing that exercise can help benefit those with Alzheimer’s disease is only part of the equation, getting them out and being active is the other part. Share this information and encourage those around you to sit less and move more. 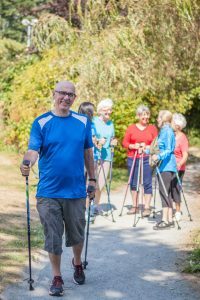 Nordic Walking is a great way to socialize and can be easily enjoyed by friends and family.